The MS-20 sound with expanded CV capabilities, FM, sync, filter switch and PWM input. Get one! It's very sturdy once built and it's pretty easy to put together. The extra switches for osc sync, FM and for flicking between the two filter revisions are very welcome additions. Sounds just like an MS-20 should but goes beyond the original spec with the new features onboard. Quite expensive, given the DIY element! Last July we reviewed Korg's limited edition MS-20 kit synth, which was essentially an exact clone of the original full-size MS-20 but with the two original filter revisions onboard. It was a little fiddly to build but, once built, it nailed the key characteristics of both incarnations of the original MS-20, albeit with slight sonic differences which we can largely put down to improved manufacturing tolerances. Moving onto NAMM this past January, Korg surprised us again with the launch of a module version of the MS-20 kit, the MS-20M, and to partner it, a new compact sequencer (the Korg SQ-1) which comes included with the MS-20M. "We would have no qualms casing this up and touring with it"
The last Korg MS module was the 1978 single oscillator (but very patchable) MS-50, and it's great that Korg have finally made a module/ desktop version of the classic MS-20 - firstly, as a lot of folks have been requesting this and, secondly, as people are increasingly working from smaller spaces and often don't want another keyboard hanging around. The module is pretty heavy (and flat) but, as it has quite a large footprint (and takes up a fair amount of desk space), it's really worth considering wall-mounting or standing it up, especially as it's just that bit too long to be rackmounted. Obviously it's saved Korg a few pennies not having to shrink down the circuitry but maybe they could have used the MS-20 mini's smaller circuit boards to make it more compact, though that would have meant a return to minijacks/no dual filter. Like the limited edition MS-20 kit, the module arrives in a '70s-looking brown cardboard box with all the major parts boxed/bubble wrapped. The MS-20M is also a limited run of 1,000 units, though we have a feeling that, due to the killer new features onboard, Korg will be forced to reconsider their limited edition status - we reckon it's going to be the most popular MS-20 yet! In the box, instead of plastic end panels, there are now real wood ends (stained black) which give the MS-20M a very sleek look, plus a shed load of screws, nuts and washers. There's a spanner included for tightening the nuts on the front panel and another device for tightening the smaller knurled nuts that fit around the small junction sockets for interfacing with the SQ-1. Apart from these, all you'll need for assembly is a crosshead screwdriver, about three hours and some patience! Assembling the MS-20M is a little less fiddly than the keyboard version but it's still monotonous, especially as there are now even more nuts and washers to fit than on the keyboard version due to the extra junction sockets onboard. Build-wise you add the circuit boards for the filters/oscillators, the patch panel, the ESP and finally the junction socketry and MIDI/power board and, like the MS-20 kit, the module is powered by a wall wart. As mind-numbing as it is building the module, it's still weirdly satisfying and you'll be giving yourself a nice pat on the back when it powers up successfully! General build quality and fit and finish are great once built and the all-metal panel/chassis and sturdy-feeling knobs should stand the test of time just like the older keyboard versions - we would have no qualms casing this up and touring with it. So how does the MS-20 differ from the MS-20 keyboard kit? Well, in most ways it's the same (two oscillators, two envelopes, two filters and a plethora of modulation options for making bubbles, squeaks, evolving sounds, basses, leads and sound effects). However, there are several key new features included. Korg has now added oscillator sync (activated via a switch between the two oscillator waveform selectors) which really sounds superb; then there's FM which is activated by a switch between the oscillator footage controls and this adds yet another level of sonic versatility to the already versatile MS-20 engine. "The MS-20M excels at making resonant/screaming/dirty sounds"
Note that when FM is selected, the MG/EXT dial (under Frequency Modulation) becomes an FM intensity control for dialling in all manner of gritty/manic textures and by turning the EG2/EXT dial you can affect just oscillator 2. A switch has also been added in the filter section so you can instantly flick between the two filter revisions whilst playing for different effects - it's much better having this switch than having to power off and hold down key combinations (as you do on the MS-20 kit). Some useful changes have also been made to the patch panel. There's a PWM input so you can connect an external LFO into the PWM socket to obtain PWM effects, or alternatively, take the output from the triangle wave of the modulation generator and PWM is applied to the square wave of VCO1. People have been doing this mod themselves for years (as PWM sounds particularly great on the MS-20) so this is a great inclusion. In terms of new patch panel socketry, added are: V/OCT VCO1+2 CV IN (the Hz/V VCO1+2 CV IN is still included), a new TRIG IN OV to High input jack, an EG2 NORMAL OUT jack and a TRIG SW out for the trigger switch. Sound-wise the MS-20M excels at making resonant/screaming/dirty sounds but it's also great for making drum sounds, thick basses and short/ punchy sounds. Of course, the MS-20M can also make softer/more pretty sounds but there's nothing quite like turning up the peak on both filters, adding some filter modulation and letting the madness begin! Once again, it's the inspiring unpredictability of the filters and the distortion/break-up at the extremes that makes the MS-20M such a versatile, characterful and fun synth. Sonically, compared to the originals (and like the mini and keyboard kit) the MS-20M is a little brighter and louder (and the way it distorts is slightly more restrained compared to our original Korg 35 model) but, rest assured, the essential character is there and it's all super-authentic. We love the fact that you can now quickly flick between the dirtier (and inherently noisier) 35 filter and the more bassy/tighter/hi-fi sound of the LM13600 filter with the flick of aswitch. Coupled with the new FM, PWM input, and osc sync modes, this is now the most sonically versatile MS-20, period. To conclude, the MS-20M is the best MS-20 yet, offering the classic MS-20 sound but now expanded with osc sync, FM, PWM, more comprehensive CV abilities, junctions for splitting/multiplying signals, MIDI in/USB and a desktop/ module configuration. 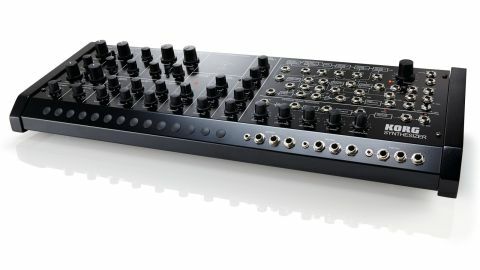 If you've been lusting after the MS-20 sound, then this is the MS-20 to get. But be quick - these 1,000 units will sell out fast!